GENEVA, Jan 21 2013 (IPS) - The international community has adopted a binding treaty for reducing emissions of mercury, a poisonous heavy metal that harms human health and the ecosystems on which life depends. The Minamata Convention on Mercury, which sets out to control and reduce products and processes using the metal, was approved on Saturday Jan. 19 by representatives of over 140 governments. It will be signed in Japan in September and will enter into force once 50 countries or more have ratified it. Mercury is a neurotoxin affecting the central nervous system and the brain. It also damages the kidneys and other body systems such as the respiratory, gastrointestinal, haematological, immunological and reproductive systems. The provisions of the treaty agreed in Geneva prohibit production, export and import of some products containing mercury with effect from 2020, including certain types of batteries, fluorescent lamps, soaps and cosmetics, and non-electronic medical instruments like thermometers and blood pressure monitors. The convention does not ban elements for which mercury-free substitutes are so far not available, like vaccines where mercury is used for preservation, and uses of mercury in religious or traditional activities. 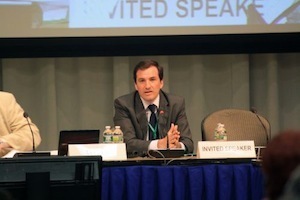 The negotiations for the Minamata Convention on Mercury, named after a city in Japan where serious health and environmental damage occurred as a result of mercury pollution in the 20th century, were chaired by Uruguayan diplomat Fernando Lugris, backed by United Nations Environment Programme (UNEP) Executive Director Achim Steiner and UNEP experts. In an interview following the adoption of the treaty, Lugris, who brought four years of negotiations to a successful conclusion, told IPS he was very satisfied by the agreement. Q: How would you sum up the progress that has been made? A: I think we have reached a high level of ambition in which regulatory measures, especially to limit mercury emissions (in) to the air, soil and water, are really ambitious. We will be able to achieve very significant global reductions. Q: What kinds of emissions are specified in the text? A: The treaty does not seek to reduce natural emissions, because mercury is an element that exists naturally on our planet. Instead, we are trying to limit anthropogenic emissions generated by the use of mercury in man-made products or processes, and we are seeking substitutes to replace it. Q: Will the convention affect countries’ economic situations? A: Basically, the treaty seeks not to impose limits on (individual countries’ economic) development, but to orient them towards sustainable development so that, in the future, processes and products will be free of mercury; that is, we seek sustainable substitutes for it. Q: Representatives of NGOs have criticised the text of the treaty. In their view the measures do not go far enough to reduce global emissions of mercury, and might even produce an increase in mercury pollution. A: I believe civil society has to raise its voice and demand that governments make greater efforts, and this convention is an important starting point. Yesterday, there was no binding treaty for the international community. Now we have one. However, this effort could be strengthened by future actions, through the evolution of the convention itself at the conferences of its parties. Q: During the negotiations, did you have difficulties with the North-South division that is a feature of most multilateral debates? A: For some issues, the North-South divide continues to exist. However, in other aspects, we perceive the world is already changing. Atmospheric emissions are a clear example, where countries like China and India are the biggest emitters because of their use of coal-fired power plants (the top source of mercury emissions). But the United States and the European Union are big emitters too. And it was very clear that in the discussions over air pollution reduction, the negotiated package gradually took shape between the big polluters. Q: Were you aware of any other grouping of countries during the negotiations? A: Yes. In discussing release of mercury into water, we found the developing countries, especially in Africa and Latin America, had clearly similar realities, and their greatest need is to seek cooperation and to help vulnerable populations. Q: How did the group of countries from Latin America and the Caribbean fare with their initiative on health? A: The GRULAC (Latin American and Caribbean Group) clearly sought to introduce health as an issue throughout the convention, and the agreed text basically contains many measures for health protection. The group also insisted on the need to include a specific article on health. In principle, the industrialised countries felt that an article on health was irrelevant in an environmental agreement. However, Latin America’s persistence and its clear interest in protecting human health succeeded in getting the final session of the plenary to agree on an article specifically about health. Q: Does the approved text provide for funding for the protection of human health? A: As the convention will have a financing body to support its implementation, clearly the measures taken will have a positive effect on the protection of human health. Above all it should be underlined that human health, in relation to mercury pollution, is not protected solely through the enforcement of specific measures to that end, but control of atmospheric emissions (in general) is the most important action to preserve human life. Q: At the last minute countries like Canada, France and the United Kingdom rejected a proposal from Bolivia to include a reference to indigenous populations in the text. How did that debate go? A: The international community has clearly formulated this issue through the (U.N.) Declaration on (the Rights of) Indigenous Peoples, which is a non-binding agreement, but unfortunately at the level of binding agreements there are still some countries that oppose making specific reference to native peoples . This is not the case in Latin America. Q: What is your opinion on this? A: Latin America supports the declaration on indigenous peoples and makes clear reference to the collective rights that were recognised in this declaration, which was in fact adopted in Geneva, having been introduced in the General Assembly session by the representatives of Peru, with the support of Uruguay.